J. A. Finch was sent to Kearney, Nebraska by Harper’s Weekly (A Journal of Civilization) magazine to cover the Grand Army of the Republic (G.A.R.) 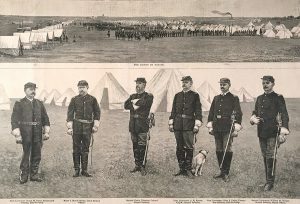 reunion in September of 1888. Finch was to provide views of the Camp Brooke and Camp Morrow encampments, the mock naval engagements on Lake Kearney, and interesting activities that took place during the reunion. Finch remained in Kearney after the reunion and had an artist studio on Central Avenue. He advertised that he did landscape sketching, prospective drawing, photo-engraving, publication illustration, mapping, tracing, and wood engraving. He listed crayon work as a specialty. He also promoted that special arrangements could be made for advertising western towns in the East. J. A. Finch also teamed up with local photographer A. T. Anderson to do photography and artwork for two Kearney promotional booklets in 1889. The Museum of Nebraska Art has one work by J. A. Finch. His work View of Kearney in 1873 is in Kearney’s Trails and Rails Museum. Researched and written by Sandra J. Mahalek, 2013, a project of MONA’s Bison Society. Howell, Alice Shaneyfelt. “Camp Henry A. Morrow: The G.A.R. Reunion of 1888.” Buffalo Tales, Nov.-Dec. 1995.